Dr. Stumpf was elected Judge of the Constitutional Court by Parliament in July 2010. 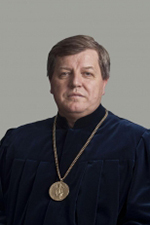 István Stumpf has been Justice at the Constitutional Court of Hungary since 2010. Previously he was the Founding Director of István Bibó College at the University Loránd Eötvös in Budapest (1982–1988); he also founded Századvég Foundation, the first Hungarian think-thank institute and was its Director for two decades (1991–1998, 2002-2010); he was the Deputy Prime Minister leading the Prime Minister’s Office between 1998-2002. He holds university degrees in law, sociology and PhD in political science. He spent years in the USA as a German Marshall Scholar and IREX scholar (Harvard University, Kennedy School of Government, and GWU, Graduate School of Political Management). Justice Stumpf has been a Senior Researcher at the Political Science Institute of the Hungarian Academy of Sciences since 1987; Professor at Constitutional Law and Political Science Department of Széchenyi István University Faculty of Law, and Eötvös Loránd University, Faculty of Law. He is a member of several academic and professional associations (Network of Institutes and Schools of Public Administration in Central and Eastern Europe; International Political Science Association, European Judicial Network) and editorial boards (President of the Editorial Board: Új Magyar Közigazgatás). Author and editor of numerous articles and books in the field of political socialisation, parties, electoral systems, constitutional and governmental structures, separation of powers and rule of law.